You want to study an ICB part-time course but you’re not sure how that works. You’ve heard about full-time and part-time study through the ICB, but what exactly is the difference between part-time and full-time study? Before you study you need to have all the information and what all this actually means. The more information you have and the more you know the better your decisions will be when it comes to your studies. Full-time learning is also known as traditional learning. Full-time learning is when you spend your day at school or university. You sit at your desk in classes that are scheduled for you. You have textbooks that you carry with you and if you miss a class you can’t do it again later. There are various advantages to studying full-time. You can fully immerse yourself in your studies. You don’t have other responsibilities such as a job to distract you from your studies. When you have a question to ask it gets answered immediately. Your teacher is right there and you don’t need to wait for hours or maybe even days to get an answer. You don’t need to worry so much about your time management. Your classes are arranged and scheduled for you. You don’t need to worry about something unexpected preventing your assignments from being received by your lecturers. When you hand in an assignment, you do so in person so you can be sure that it has been received. Of course, like anything else, full-time study has disadvantages too. Some might be obvious while some you may never have considered before. Your classes are at specific times and can’t be changed. This means that if you miss a class or you’re going to be late, you can’t move the class to a more convenient time. If you lose your textbooks or study materials it could be very difficult and expensive to replace them. Your lecturers only have so much time during a class. This means that they don’t have a lot of time to answer questions. Classes at a university or college tend to be quite large meaning that the lecturer has many assignments to mark. This means that it might take a long time to get feedback on your assignments. Part-Time study is very similar to full-time study in that you still attend scheduled classes at a university or college. Distance learning courses can also be done part-time or even full-time. The difference is the amount of time you spend at college or university. Part-time students generally attend classes in the evening or on the weekend. This makes part-time study a more flexible option. However, as a result of this, part-time studies tend to take longer than full-time study. Part-time study is a very popular study method due to its many advantages. More flexible hours which mean you can study and work at the same time. Most of your studying can be done at home except for some lessons that you need to attend. Apart from the evening or weekend classes, you can schedule your own study times. A lot of your study materials will be available online which will make it cheaper than if you had to buy all the textbooks. Many of the disadvantages of part-time study are very closely connected to the advantages of part-time study. Due to the fact that you only have a few classes in a week, you will have less interaction with your lecturer. It takes a lot more self-discipline to study. Since you aren’t forced to sit in a class you have to make sure you spend the necessary time to study. Most of your studying is self-study so you don’t have a lecturer to ask questions to until your next class. You have less interaction with fellow students. This also means that you have fewer people you can discuss your course with or compare notes with. Is Distance Learning the Same as Part-Time Study? The answer to this question has to be “not quite”. The reason for this is that though distance learning is a form of part-time study and shares many similarities with it, it also has many differences. Distance learning also allows you to have flexible hours and work while you study but it does not require you to go to classes at all. At the same time, you can study distance learning courses full-time if you want to. Distance learning is becoming increasingly popular as a study method due to these reasons and more. There are many companies, like Skills Academy, that provide excellent accredited and non-accredited courses for you to study. As this article proves, there is no one option which is best. It all depends on you, your time, your budget and how committed you are to your studies. If you are someone who struggles to study on your own then looking into full-time studies would be best. If, however, you don’t have the time for classes or have no problem studying alone then Part-time or Distance Learning might be the better option for you. You simply need to decide on what is best for you. You can learn more about the differences between Classroom Learning and Distance Learning in the ICB Distance Learning courses article. 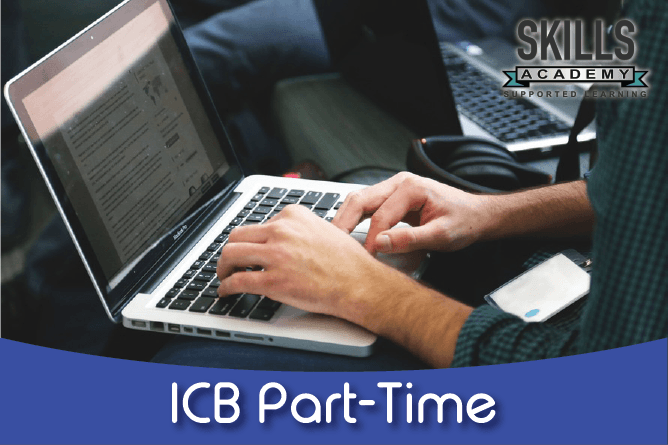 What ICB Courses are Available for Part-Time Study? All the ICB courses can be done through part-time study. To do this you will need to register for an ICB course through a distance learning college such as Skills Academy. The ICB has five different study options for you to take, namely Business Management, Financial Accounting, Entrepreneurship, Public Sector Accounting, and Office Administration. Each of these five study options has several qualifications you can study. You can see the full list of courses below. If you want to study an ICB part-time course then you can call Skills Academy toll-free on 0800 39 00 27. One of our course consultants will help you get all the information that you need and they will help you to register over the phone. Why delay? Call us and sign up for a better future, today!